Hy-Vee’s commitment to protect ocean resources is an integral part of our sustainability mission to do business in a manner that promotes the well-being of our customers, employees, communities, and the global environment. Seafood products bearing the “Responsible Choice” symbol meet Hy-Vee’s Seafood Procurement Policy and are caught or farmed in a responsible manner. Specifically, these options are rated as either Green ‘Best Choices’ or Yellow ‘Good Alternatives’ by the Monterey Bay Aquarium’s Seafood Watch program, or are certified to an equivalent environmental standard. Responsible Choice seafood comes from sources, whether fished or farmed, that can maintain or increase production in the long term without jeopardizing the structure or function of affected ecosystems. When you purchase seafood that is responsibly farmed or harvested you are supporting best practices that will help ensure a healthy supply of seafood for generations to come. Our Seafoodies Blog is a great place to find weeknight or special occasion recipes featuring our Responsible Choice seafood. Looking for seafood that’s good for the environment and good for your family? Here is a list of Responsible Choice seafood that’s also low in mercury. *These species contain the daily minimum of omega-3 fatty acids per 3.5 oz serving. For more information, visit fishwise.org and edf.org/seafood. The actual fish for sale has not been tested. How do we make sure our seafood comes from responsible sources? Hy-Vee’s Seafood Procurement Policy establishes environmental sourcing criteria as well as expectations for traceability and social responsibility within our seafood supply chains. We developed our policy in partnership with FishWise, a sustainable seafood consultancy that promotes the health of ocean ecosystems through environmentally and socially responsible business practices. Hy-Vee and FishWise collect information from our seafood suppliers about where our seafood products come from at least once a year. FishWise reviews the data, as well as any certification claims, to verify that seafood products are compliant with our Seafood Procurement Policy and determine what can be labeled “Responsible Choice.” We do this for all our seafood products whether they be swai in our frozen case, salmon in our Nori sushi bars, or canned tuna in the grocery aisle. In addition to collecting data on our seafood products, Hy-Vee sends a Supplier Expectations Letter to our seafood suppliers, which updates them on the Seafood Procurement Policy and outlines expectations for their critical role in ensuring that seafood is harvested in compliance with the policy. In 2017 Hy-Vee became the first Midwest retailer to source 100% of our fresh and frozen seafood from environmentally responsible sources. The timeline below highlights some of our other major accomplishments. February 2016 - Hy-Vee achieves sustainable seafood goal to source 100% fresh and private label frozen seafood from responsible choices. Hy-Vee is the only Midwest retailer offering Responsible Choice private label shelf stable tuna. Made with skipjack tuna (Katsuwonus pelamis) sourced from sustainable, MSC-certified pole-and-line fisheries. This traditional method of tuna fishing is highly selective, catching one fish at a time and producing very little bycatch. Made with albacore tuna (Thunnus alalunga) sourced from sustainable, MSC-certified pole/troll fisheries. This method of tuna fishing is highly selective and ocean-friendly, and because pole/troll-caught albacore fisheries target younger tuna, it has lower levels of mercury than older fish caught in unsustainable longline fisheries. Made with skipjack tuna (Katsuwonus pelamis) sourced from purse seine tuna vessels that do not use fish aggregating devices (FADs). The FAD-free method of fishing typically captures less bycatch, or non-target marine species, than fishing on FADs. Made with albacore tuna (Thunnus alalunga) sourced from sustainable pole/troll fisheries in the Pacific Ocean. Hy-Vee is committed to using and procuring seafood from legal sources. Our Seafood Procurement Policy includes traceability and social responsibility components which apply to all our seafood supply chains. Our Due Diligence Plan shows the progress Hy-Vee is making toward meeting these components. Being an industry leader in sustainable seafood means extending our work beyond our direct purchasing and engaging with the larger issues at hand. Hy-Vee believes that in order to take better care of our oceans and fish species, we also have to take care of fishermen and their communities. We are partnering with Fair Trade USA, a nonprofit organization and the leading certifier of Fair Trade products in North America. Through our partnership, we’re working to build more resilient livelihoods in coastal communities, improved working and living conditions, increased supply and demand for responsibly sourced seafood, and enhanced environmental stewardship and ecosystem protection. The Fair Trade Certified TM label is a mechanism to reward best-in-class seafood companies for their commitment to sourcing ethical seafood, and we’re proud to be part of it. Hy-Vee understands that some of the biggest threats to the ocean and coastal communities can start on land. In October 2017, Hy-Vee joined the Businesses for Bristol Bay coalition to advocate for the protection of Bristol Bay, the most pristine and productive wild salmon habitat in the world, from potentially devastating impacts from the proposed Pebble Mine project. If developed, toxic runoff from the Pebble Mine would contaminate nearby Bristol Bay, where Hy-Vee sources much of our wild salmon. An environmental disaster would jeopardize thousands of independent businesses, tens of thousands of jobs, and an economic engine that sustains Alaska’s economy. As part of this effort, Hy-Vee signed on to a letter to President Trump and U.S. EPA Administrator advocating for the protection of Bristol Bay. In support of legal and traceable seafood in the United States, Hy-Vee sent letters to representatives in the U.S. House and Senate urging them to pass legislation that addresses illegal fishing and cracks down on human trafficking. The Illegal, Unreported, and Unregulated Fishing Enforcement Act of 2015 was signed into law on Nov. 5, 2015. This is an important step toward ensuring our U.S. seafood marketplaces is composed of safe, legal and responsible seafood and that illegal fishing are reduced in the waters around the world. Hy-Vee’s policy is to sell seafood that is safe for consumption and harvested or raised in a responsible manner. Hy-Vee will not purchase or sell genetically modified or genetically engineered seafood. We are confident this is the best decision for our customers as well as the environment. Genetically modified and genetically engineered seafood products are inconsistent with Hy-Vee’s Seafood Procurement Policy, which can be found here. 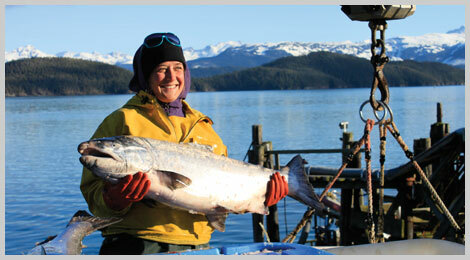 Our commitment to not sell genetically engineered seafood is highlighted on the Friends of the Earth pledge website. A fishery improvement project (FIP) is a multi-stakeholder effort to improve a particular aspect of a fishery. FIPs are an important component of Hy-Vee’s Seafood Procurement Policy as they provide a direct pathway for Hy-Vee to encourage improvements on the water – be that through strengthening fisheries management policies or by providing incentives for fishers to reduce the environmental impacts of their fishing gear. To promote healthy oceans and ensure long-term seafood suppliers, Hy-Vee is actively encouraging its seafood suppliers to participate in FIPs. Hy-Vee has officially committed to the United Nations’ Sustainable Development Goals, a set of 17 targets that aim to eliminate poverty, protect the environment, and promote global peace and prosperity. Our involvement centers around a group commitment created by Conservation International and supported by our partner FishWise: Committing to Social Responsibility in Global Fisheries and Aquaculture. Our pledge addresses human rights in seafood supply chains and aligns with one of the 17 overall goals, Goal 14: Life Below Water. As the first retailer to sign on, we are committing to best practices in social responsibility in the seafood sector, including adopting Fair Trade Certified seafood, practice due diligence to combat possible human rights risks in our seafood supply chains, and annually reporting on progress against these targets. Be sure to check back periodically for updates on this goal and Hy-Vee’s milestones in social responsibility. Creating lasting and meaningful change requires collaboration. Hy-Vee participates in external industry stakeholder groups to advocate for sustainable seafood on a national level. Currently, we serve on the Food Marketing Institute’s (FMI) Seafood Strategy Committee, Sustainability Committee, and Private Brands Group Leadership Council. We also work with the Alaska Seafood Marketing Institute (ASMI), Bristol Bay Regional Seafood Development Association and Copper River Prince William Sound Marketing Association. Several years ago, Hy-Vee became one of the first retailers in the Midwest to hire our own U.S. Department of Commerce (USDC) lot inspector to ensure the quality, safety and integrity of the fresh seafood it buys. The USDC inspector is stationed on-site at our Perishable Distributors of Iowa (PDI) distribution facility in Ankeny, Iowa, where he routinely checks incoming shipments of fresh seafood, ensuring that it meets Hy-Vee’s standards. To help us achieve our goals of sourcing sustainable seafood, we partnered with FishWise, an organization that promotes the health of ocean ecosystems through environmentally and socially responsible business practices. FishWise helps companies improve the sustainability of their seafood offerings through employee training, sourcing assistance, and point-of-sale information. Their programs allow consumers to make environmentally informed choices when purchasing seafood.